Finished Off Putting Up Plywood Panels on I-Beams Before Thunderstorms arrived! 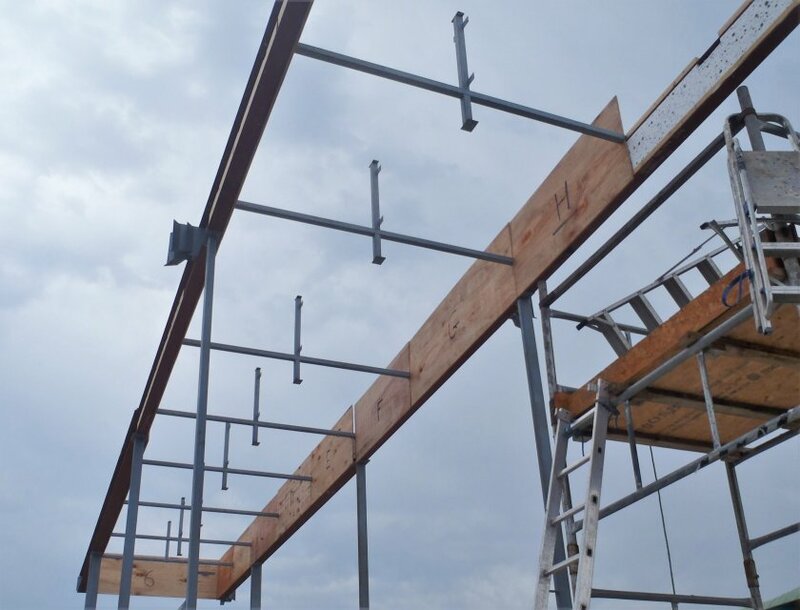 This morning, we went around and finished off mounting the plywood coverings on the Steel I-Beams before the thunderstorm arrives. We did dash in for 15 minutes at around 11:30am but that was only a small fringe effect of a thunderstorm heading elsewhere!! We concluded this morning with putting up the seven panels and we have only one more to do when we have created the steel support arm for the chimney. It all went up fairly well in the end and now we can look forward to doing the next stage of building up the Skylight by installing the timber framework on top of the steel I-Beams, and flush against the plywood boards. But first, we are making the chimney support arm this afternoon during the thunderstorms!